Ladakh, known for its breathtaking natural beauty, colourful mountains is soon going to be famous in sustainable energy field as well. Known as the “roof of the world,” the scenic Ladakh region of the Indian state of Jammu and Kashmir can soon host the world’s largest single-location PV plant. SECI (Solar Energy Corporation of India) a CPSU under the administrative control of the ministry of Renewable Energy – is planning to setup 23GW Solar PV Projects in Leh & Kargil regions in Jammu & Kashmir. In line, SECI has recently released RFS for setting up solar power plants of 2500 MW in Kargil district and 5000 MW in Leh district. Currently, China’s Datong Solar Power Project – with a projected capacity of 3000 MWp – has the potential to become the world’s biggest single-location solar PV project, once completed. 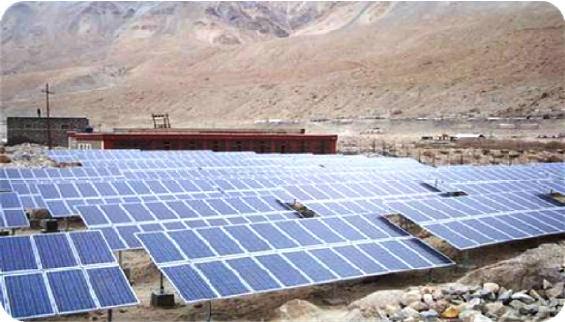 However, with Ladhak Project, India has resumed its contest with China to host the world’s biggest solar park. Projected Capacity of 5000 MWp. The Ladakh project is expected to be complete by 2023. Power generated will be transmitted, along a 900 km stretch of the Leh-Manali road, for consumption by Kaithal district in the state of Haryana. Leh and Kargil administrations have designated 25,000 and 12,500 acres of non-grazing land, respectively, at prices “remunerative” for the hill councils, which will also earn rental of around Rs 1,200 per hectare per annum with 3% annual escalation.